This is the second largest Jigsort in the Jigthings range. It will accommodate many puzzles up to 1,000 pieces - sizes up 29.5 inches x 20.5 inches. Some of the USA puzzle manufacturers make 1,000 piece puzzles larger than this so please check puzzle sizes carefully. To accommodate ALL conventional 1,000 piece puzzles you will need the Jigsort 1500. Firstly, there is a firm "Construction Board" (a Jigboard made from rigid board not cardboard) on which the puzzle is made. The board is completely covered in a special soft fabric that makes it a joy to work with. It can be placed on any table or shiny surface without the least fear of scratching. The fabric covering keeps the pieces attached to the surface and this, combined with a raised edge around the board, ensures that individual pieces are never lost. Whilst a jigsaw is being made the board is taken out of the outer case to make it easy to move around. Secondly, there are 4 "Sort Trays" that provide a means to store the non-assembled pieces. The Sort Trays are covered in the same special soft fabric as the Construction Board and if required each one can be used for assembling small sections for later transfer to the main board. The third element is the stylish outer case into which the above items containing your part-assembled jigsaw are packed away. 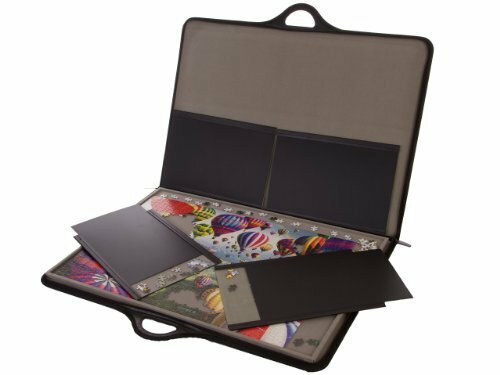 The case has a zip to ensure that no pieces can be lost and an integrated, fully stitched handle (no rivets, screws or staples) enables you to safely transport your jigsaw from room to room, or place to place.